Using a mandolin, cut the potatoes as thinly as possible into strips, then put into a bowl of cold water to rinse off the starch. Drain and dry well with paper towels. Fill a deep-fryer with the oil to the manufacturer’s recommended level and heat to 176°C/350°F. Working in batches, fry the potatoes until golden, then drain on paper towels. Keep hot. Put the egg white and milk in a bowl then mix. Rub the fish with the egg white mixture. Finely chop the herbs. Sift the flour into a bowl then add the herbs, sesame seeds, chilli powder and seasoning. Deep-fry the parsley leaves. Be careful, as they spit furiously, but will be crisp as soon as the spitting stops. Remove and drain on paper towels. Dip the fish into the bowl of flour mixture to coat and fry two pieces at a time for 2-3 minutes until just cooked. Drain on paper towels and serve with the fried leaves and crisp shoestring potatoes. Stand the pears upright in a deep, ovenproof dish. Put the wine, port, juniper berries, lemon peel and sugar in a saucepan and bring to a boil, stirring until the sugar dissolves. Pour the mixture over the pears to cover. Stir in the stem ginger and syrup. Cover and bake for 45-60 minutes, or until the pears are very tender. Baste them 2-3 times during cooking. Remove from the oven and, using a slotted spoon, transfer the pears to a deep bowl. Pour the cooking liquid into a saucepan and stir in the arrowroot until mixed. Bring to a boil, stirring until the syrup is smooth and slightly thickened. Remove and discard the lemon peel, then pour the syrup over the pears. Serve immediately or refrigerate overnight: the flavour and colour will intensify. To serve, mix the whipped cream, ginger syrup and lemon peel until blended. 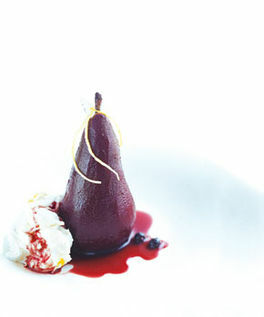 Serve alongside the pears and drizzle over the wine syrup.